← Happy Birthday, Beverly Cleary! Does our centenarian national treasure really need an introduction? Probably not, but maybe her early Young Adult novels do! Beverly Cleary’s YA romances from the 1950s are less well-known than her later works featuring Henry Huggins and the Quimby sisters, although they have been consistently in print for nearly 60 years: Fifteen, The Luckiest Girl, Jean and Johnny and Sister of the Bride were all reissued by Dell in the 1980s as part of their Young Love series, and in subsequent editions with increasingly dull cover art. 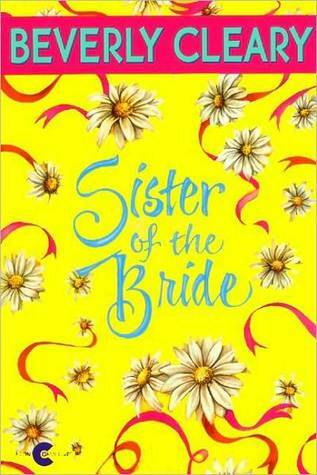 Sister of the Bride was the last of the four to be published, and the only one after 1960. And, delightfully, this coming of age story set in the San Francisco suburbs is notable for the fact that THE SIXTIES are definitely coming! The Plot: High school Junior Barbara’s MacLane and her entire lower-middle class family’s life is upended when her sister Rosemary, a freshman at Berkeley, announces her engagement to a former Air Force Captain eight years her senior. While the MacLanes like Captain Greg well enough and think he has good career prospects (he’s studying for his teaching certification and moonlighting at Berkeley’s radiation laboratory, “where they smash atoms”), Rosemary has also long been regarded as kind of a dingbat by her family; what if this engagement is just another screwball impulse of hers? She recalled that once when Rosemary had bought a cotton skirt with L’amour! L’amour! L’amour! Printed all over it, their father made her return it to the store. He said it made her look boy crazy. Barbara is in her sister’s corner from the start, dreaming of a romantic wedding like she reads about in the society pages, far removed from her day-to-day reality of middle-childdom: a little short, a little chubby, with an annoying 13 year old aspiring folk singer for a brother, and pursued only by gloomy jazz trombonist Tootie Bodger. Mr. and Mrs. MacLane, children of the Great Depression and World War II, are at first aghast at the idea, but eventually come around, genuinely concerned only about providing their children with an easier start to adult life than they had themselves. Can Greg’s gig at the atom-smashing laboratory pay the $25 a month to Rosemary’s orthodontist for her still-needed retainer? More concerns arise when they finally get used to the idea and then meet Greg’s parents, and discover that they are far wealthier than Greg had let on: Mrs. Aldredge arrives for dinner wearing a mink stole, which Barbara later finds her brother’s cat taking a luxuriant nap upon. The Aldredges also expect the wedding to be a large affair, handing over typewritten cards with the names and addresses of roughly 200 of their closest friends and family to be invited. After taking in the MacLane’s shabby living room, and Mr. MacLane’s story of having turned the local high school print shop into the best in the county (“And now most of those kids are earning more than I do!”), they embarrass everyone by offering to pay for the wedding. Meanwhile, in a campaign to prove herself practical, Rosemary is taking things too far in the other direction, announcing that she plans on getting married in a suit and won’t even have an engagement ring! “Now what on earth do you mean by a remark like that?” Mrs. MacLane’s exasperation was rising to the surface once again. “I can’t believe she’d say a thing like that,” said Mrs. MacLane. Cleary, a child of the Depression and wartime bride herself, usually extends equal sympathy to all of her characters, and takes all adolescent concerns seriously. However, here she maybe extends a little more of that sympathy to the parents. Especially when she brings out the big guns and Grandma comes to visit, bringing with her her own handmade lace bridal veil, packed away for 50 years after Mom was married in a muddy Army camp after Pearl Harbor and Aunt Josie opted for spinsterhood and a prestigious job as a buyer for a department store’s girdle department. ARE YOU REALLY GOING TO BREAK GRANDMA’S HEART, ROSEMARY? This produced complete silence from the older women. It’s interesting: after 50+ years in print, I suspect the reader’s sympathy has swung a full 360 degrees. While Rosemary was ahead of the curve on embracing her generation’s hippie earth-tones (Grandma: “Earth tones, indeed! Dirt-colored is more like it”), Mom, Grandma and Aunt Josie (Cleary-surrogates all), refusing to sacrifice aesthetics for ugly functionality seems reasonable. Grandma wiped the corner of her eye. One of her daughters had not married at all, while the other had a wartime wedding in an army camp, while Grandma’s veil had lain in its tissue paper for over half a century. “Father gave me a beautiful wedding, even though I was marrying a poor boy,” said Grandma, as her shaky hands lifted the veil, creamy with age, from the box. “Of course that was before he lost his money on mining and streetcar stocks. I had six bridesmaids and two flower girls.” She unfolded the veil and let it fall to the floor, and sat looking at it, her face soft with memory. There is a lot (A LOT!!!) more to be said about how the much book values traditionally feminine labor, embodied by The Amys, Mrs. MacLane’s social club who LITERALLY STEP IN AND SAVE THE DAY when this nine-headed hydra of a wedding monster gets out of control (and Rosemary’s shiftless hippie roommate proves more adept at tootling folk tunes on her recorder than sewing her bridesmaid’s gown)… but lucky me, Lizzie Skurnick already covered that angle in a 2008 Fine Lines column. Back to my recorder tootling! Meanwhile, Barbara has to contend with a very different kind of potential beau than Good Ol’ Tootie Bodger (whose real name is Robin), when she attracts the notice of Vespa-riding high school lothario Bill Cunningham, who seems to value Barbara mainly for her traditionally feminine talent for cookie baking (although as Rosemary’s wedding takes over the household she has no time for baking, resorting first to refrigerated dough, then outright buying cookies from the bakery and passing them off as her own). Tootie and Bill. What a pair. She did not even know which she preferred, Bill’s thoughtless exuberance or Tootie’s fumbling seriousness. But she did know one thing- it was going to be fun to find out. This entry was posted in Vintage YA Fiction and tagged 1963, Author C, Beverly Cleary, Coming of Age, High School, Morrow Junior Books, Romance, Title S. Bookmark the permalink. Funny about the silverware! I got married in the mid-80s and my mother-in-law was appalled that I chose stainless rather than sterling for my “formal” silverware. (It caused a dispute — gasp!) I got fifteen place settings (which I still use). My two sisters-in-law got almost none of their sterling patterns as gifts because no one could afford it. I don’t think young couples even register for place settings anymore 😉 . This is such a great point! Why register for things your guests can’t afford to buy?! Who needs 2 place settings of silver? I loved this book! Except I 100% disagreed with Rosemary on all counts. I was always one for the pretty things. Also: I am still sorry about what happens to the veil. The veil is TRAGIC! I take some comfort in the fact the Amys were able to save it to see another generation. Also I think that Rosemary was definitely over-compensating for her family thinking she was a ditz and attempting to show that she was sensible and grown-up. One of the time-capsule details is the parents fretting about the trend couples getting married so young (one of my favorite pieces of trivia is that teenage pregnancy in the U.S. peaked in the late 1950s because so many women were getting married so young). When Millie was working oh-so-slow-ly-and-care-ful-ly on her bridesmaid gown. I figured Cleary was strongly implying that Millie really didn’t know what she was doing, but didn’t want to admit it. Most likely, she was partly trying to insure against rookie mistakes by following the instructions slavishly, and partly stonewalling, hoping that someone would do exactly what that one woman did do — “simply [take] the whole thing away from her” and finish it in one night. As you noted, this book was written and published during a time of societal transition, and this was one of many indicators: not all young women had been taught domestic arts from A to Z. One of my sisters declined to be a bridesmaid because she would have had to make her own gown, and that was in the early 1990s. When the bride got the same sorry-but-I-can’t from the other candidates, she called Sis back and said “What if you only had to buy a gown?” So Sis and the rest of the crew stood up in the wedding wearing bought gowns. The bride was a design major, you see, and it didn’t occur to her that not everyone had her skills! In all of Cleary’s YAs the heroines are proficient at sewing! Like I mentioned, this one stands out for passing a little judgement on women like Millie and Bill’s mother for their lack of domestic skills (although spinster department store-buyer Aunt Josie mostly gets a pass). Really all of them? I know Jean earned the money for her “trim little figure” dress by sewing choir stoles, but I don’t remember Jane or Shelley sewing anything. Oooh, you may be right about Shelley, I’d have to double check. Didn’t Jane have the plaid skirt that she didn’t match up the pattern or was that Jean, too? Yes, that was Jean. It’s what she was wearing when Johnny asked her to dance, to underscore the dowdy-librarian motif. Jane babysat so she could buy clothes. We see Jane knitting complicated argyle socks as a Christmas gift for Stan, but the book ends before then. She probably learned to cook and sew in Home Ec, but I think that her mother wanted Shelley to have the best things that her great depression raised parents now had the means to provide. Shelley does admire the sweater Katie’s grandmother makes but also understands why Katie hates it.The sweater being made for Luke isn’t finished by the end of the book and we don’t know how he’ll handle it. Grandma does have his back wrt his motorcycle. I think Shelley was too busy alternating between swooning and cringing to do any sewing. She did, however, come up with the idea of the white piqué for Katie’s dance. What a wonderful review. Sister of the Bride holds a special place in my heart, and I’m so glad Beverly Cleary is still with us. Most of my favorite childhood authors have passed on and it makes me sad. And isn’t wonderful that these are still in print! I’m always a little surprised that even though the details are a little dated, the humor and emotions are still totally relevant! Did anyone else notice that, alone of Cleary’s YA protags, Barbara does not have a Best Friend? Jane has Julie, Jean has Elaine, Shelley has (a different) Rosemary at home and Jeannie in San Sebastian. Late in the story, Barbara phones “a friend” and vents about the wedding (and gets “Ooh, I wish there was a wedding in *my* family!”), but that’s it for female bonding. Makes things especially poignant when you realize that Rosemary probably filled that slot, and that’s coming to an end. Yes I think its one of the things I just love about Cleary – theres a “poignancy” ….. I keep forgetting to post about this: I’m galled on Barbara’s behalf that she didn’t get to go on the bridesmaid-gown shopping trip, on the grounds that she had to stay home and make lunch for her father and brother. The net result was positive, of course, because she was there to save Gordy’s costume, but her being excluded is wrong on multiple levels. She’s left out of a family excursion; she gets no input into choosing a gown she’s going to wear; and…was the lunch just an excuse to ditch Barbara, or did mom seriously think that her thirteen y/o son couldn’t slap together a few sandwiches for himself and dad? Hmmm…..especially since she’s to be MOH!